Haynes Manuals produce a wide range of informative, practical manuals and books suitable for novices and experts alike. These books principally focus upon the construction, maintenance and repair of automotive vehicles, covering a variety of makes, models and years. TO FIT - KAWASAKI ZR1100 A1/A2 (92/93) ZEPHYR 1100. PART NUMBER - 99924-1152-02. ZR750J (Z750) 748cc 04 - 06. ZR750L/M (Z750) 748cc 07 - 08. Haynes Manuals produce a wide range of informative, practical manuals and books suitable for novices and experts alike. These books principally focus upon the construction, maintenance and repair of automotive vehicles, covering a variety of makes, models and years. UK: EX500A (GPZ500S) 498cc 87 - 93. UK: EX500D (GPZ500S). UK: EX500E (GPZ500S). Haynes Manuals produce a wide range of informative, practical manuals and books suitable for novices and experts alike. 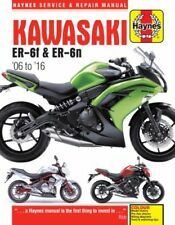 Haynes Manual Kawasaki ER-6f & ER-6n 2006-2016. Keep your Bike in perfect running order and maintain it's value with this service and repair manual. Haynes shows you how and saves you money. This manual is a must, gives you step by step instructions clearly linked to hundreds of photos and illustrations. S1 KH250 (S1 A-B-C & KH) Full Parts List & Diagrams. Kawasaki KH250 Wiring Diagram. S3 KH400 Full Parts List & Diagrams. Kawasaki KH400 Wiring Diagram. Kawasaki KH400 CDi Wiring Diagram. Versys 1000 1043cc 12 - 16. Z1000 1043cc 10 - 16. Haynes Manuals produce a wide range of informative, practical manuals and books suitable for novices and experts alike. These books principally focus upon the construction, maintenance and repair of automotive vehicles, covering a variety of makes, models and years. SEE PHOTOS FOR MORE INFO. STAPLES ARE ORIGINAL. THIS IS A VERY GOOD CONDITION ORIGINAL BOOK, NOT CONCOURSE BUT ADDS TO THE CHARACTER FOR YOUR CLASSIC Z900. THIS IS IN VERY GOOD CONDITION FOR 43 YEARS OLD . this is a 33 year old Kawasaki z650 B1 owners manual.it is a bit scruffy on the outside but good on the inside like me.very rare to find these now. Kawasaki ZX9R ZX-9R ZX900-C1 Motorcycle Owners manual. Kawasaki ZX9R ZX-9R ZX900-C1 Motorcycle Owners manual.. Condition is Used. Dispatched with Royal Mail 1st Class recorded. 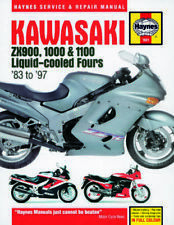 Kawasaki ZR550 ZR750 Zephyr Fours 1990-97 Haynes Workshop Manual. Condition is Used. Dispatched with Royal Mail 1st Class. Sales brochure for Kawasaki KR-1 250 cc two stroke twin. Good condition, no folds or tears and colours are bright and unfaded. Great for owner of this now very rare bike or collector of Kawasaki memorabilia. 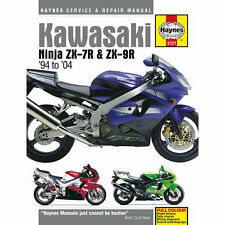 Haynes Manual - Kawasaki ZX-10R 2004 - 2010. Keep your Bike in perfect running order and maintain it's value with this service and repair manual. Haynes shows you how and saves you money. This manual is a must, gives you step by step instructions clearly linked to hundreds of photos and illustrations. .I couldn't live without my Haynes. Superbike. Inside this manual Step-by-step instructions: clearly linked to hundreds of photos and illustrations guide you through each job. Fully indexed to help you find information easily. 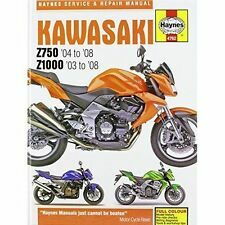 Kawasaki Z1 & Z1B Haynes Manual . Condition is Used. Dispatched with Royal Mail 1st Class. Kawasaki Z1 900 SALES PROMOTION BROCHURE 1973. RARE ITEM. 2017 Kawasaki Z1000SX NINJA: 237 Pages. Final Drive. Engine Removal/Installation. A ge nu in e Kawasakio wn er s ma nu al i n co mp le te o ri gi na l condition. 500 H1 UK USA 1972-1976. Kawasaki S1 S2 S3 KH250 KH400 Collection Of Sales Brochures - SPECIAL. Kawasaki S1 250 Brochure (Original Part No:99980-) X4 Pages. These are New High Quality Reproduction Facsimiles from the original Kawasaki Brochures (exact Copy). 13 x Brochures in Total. All are in 280 x 210mm (Kawasaki Standard Format) either 2/4 or 6 x Pages each. Kawasaki Workshop Manual. Covers zx900,1000 and 1100 liquid cooled fours ,1983 to 1997. Good condition. 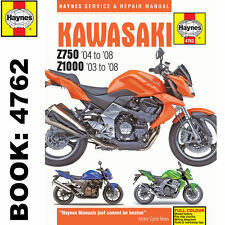 Haynes Manual 0325 - Kawasaki 500 & 750 3 Cylinder Models (69 - 76)-LIMITED EDITION RE-PRINT. KH500 499cc UK '76 only / 500 H Series 499cc USA 69 - 74. Haynes Book No 0325. With a Haynes Manual, you can do it yourself; from simple maintenance to full repairs. Kawasaki KDX125 SR sales brochure. Genuine Kawasaki sales leaflet. Kawasaki KDX125 SR sales brochure. This is a genuine Kawasaki sales leaflet on this classic little motorcycle. I live near junction 4 of the M20 in sunny Kent. A rare service manual supplement printed by Kawasaki Heavy Industries. Covers GPz (ZX) 1100 unitrak (A series) and KZ (Z) 1000. See second photo for confirmation of models covered. In Good used condition. 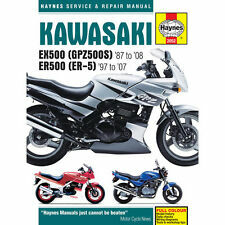 Used Kawasaki genuine service manual for the Kawasaki GPZ900R. Part number: 99924-1048-04. 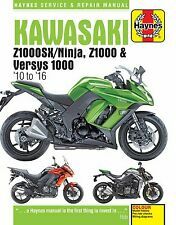 Haynes ManualKawasaki Z1000, Z1000SX & Versys 1000 2010-2016. Versys 1000 1043cc 2012 - 2016. Z1000 1043cc 2010 - 2016. Keep your Bike in perfect running order and maintain it's value with this service and repair manual. GENUINE KAWASAKI W650 MOTORCYCLE SERVICE MANUAL. COVERS 1999 EJ650-A1. TO FIT - KAWASAKI ZX900B1-B4 94/97. PART NUMBER - 99924-1171-04. Z1, Z1A, Z1B, Z900A4, Z1000A1, Z1000A2. NEW (ENGLISH LANGUAGE VERSION). In excellent used condition exceptionly clean. 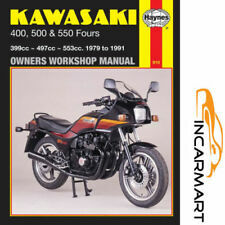 Kawasaki (K)Z 1100 A (Shaft Drive) 1981-1983 Manuals - Clymer (Each). THIS IS THE MANUAL THAT YOUR LOCAL KAWASAKI DEALER WOULD HAVE USED TO,SETUP,SERVICE ,FAULT FIND,REPAIR,TUNE AND REBUILD YOUR KAWASAKI BACK IN THE 1980'S. VERY USEFUL IF YOU ARE SERVICING,REPARING,RESTORING OR OWN ONE OF THESE GREAT BIKES. THESE ARE THE MANUALS YOUR LOCAL KAWASAKI DEALER WOULD HAVE USED TO SERVICE, REPAIR,TUNE,SETUP, FAULT FIND,REBUILD AND QUITE OFTEN RACE PREPARE YOUR ZXR400 BACK IN THE 1990'S. 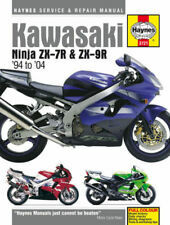 VERY USEFUL IF YOU ARE RESTORING,RACING OR OWN ONE OF THESE GREAT KAWASAKIS. USED GENUINE KAWASAKI VULCAN 800 VN800 DRIFTER MOTORCYCLE SERVICE MANUAL. This used 1st edition manual is in good condition with a few age related marks. Kawasaki H1 H1D 500cc 1973 Parts Manual & Sales Brochure. Full Kawasaki 500cc H1D Parts manual for the 1973 Model – (All Ringbound - A4) x1. Kawasaki 1973 500cc H1D Sales Brochure (6-Pages Portrait 610mm x 280mm) x1. FREE to Mainland U.K. only. Original Part No: 99997-605. 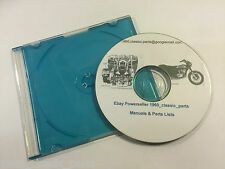 Kawasaki S2 S2A 350cc 1972 1973 drum & Disc Parts Manuals. Full Kawasaki 350cc S2 Parts Manual for the 1972 Model x1 (All Ring bound Approx. FREE to Mainland U.K. only. This is a Thick Book! ). Kawasaki Ninja 250R Service and Repair Manual (1988-2012). This service and repair manual provides specific, detailed instructions for performing everything from basic maintenance and troubleshooting to a complete overhaul of the Kawasaki Ninja 250 motorcycle. Kawasaki VN900 VN 900 Classic. Italian Maintenance Manual Handbook. All text is legible. Kawasaki Z1300 KZ1300 Touring Motorcycle. Owners Manual Handbook. Manual is tatty and worn but is fully legible. No back page. Sorry but for orders outside the UK we do not accept credit/debit cards.